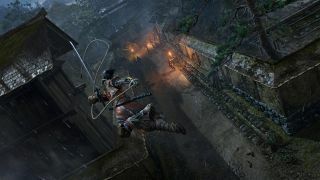 In Sekiro you play a shinobi on a quest for vengeance. An army of enemy soldiers and monsters stand in the way, but they can’t fight you if they can’t see you. You can battle everyone face to face if you want to, but why risk your life when you can stealthily avoid enemies, or kill them instantly from the shadows? The dark fantasy world of Sekiro has many places to hide. Crouching in the long grass makes you practically invisible. You can use this position of safety to observe enemies in an area and look for routes past them. If you catch an enemy in the long grass you can kill them instantly with a Deathblow finisher from stealth. Your shinobi can also grapple up to high ground. In forested areas high branches offer stealthy pathways that can help you to evade enemies. Alternatively you can position yourself directly above an enemy to open up an insta-kill drop attack. In tiered temple areas you can use your grapple to approach rooftops from unexpected angles and attack enemies in the back for an instant kill. Whenever an opponent’s back is exposed you have a chance to take them out. A gas explosion in the middle of combat can hide your position and let you get some sneaky stealth kills, even in the middle of a group. Even if you prefer to fight every enemy, stealth is a powerful tool. You can often take out the first member of a group instantly from stealth, improving your odds against the rest of your enemies. A combination of stealth and outright brawling may be the smartest way to play.